ReAKKT: Sterilizing SNB intervention with ECB help? Swiss National Bank has announced today it will defend EURCHF at the 1.2000 level at any cost. It has declared it is prepared to sell UNLIMTED amounts of CHF. This means buying adequate amounts of EUR. In theory, SNB can print unlimted amount of Swiss francs. 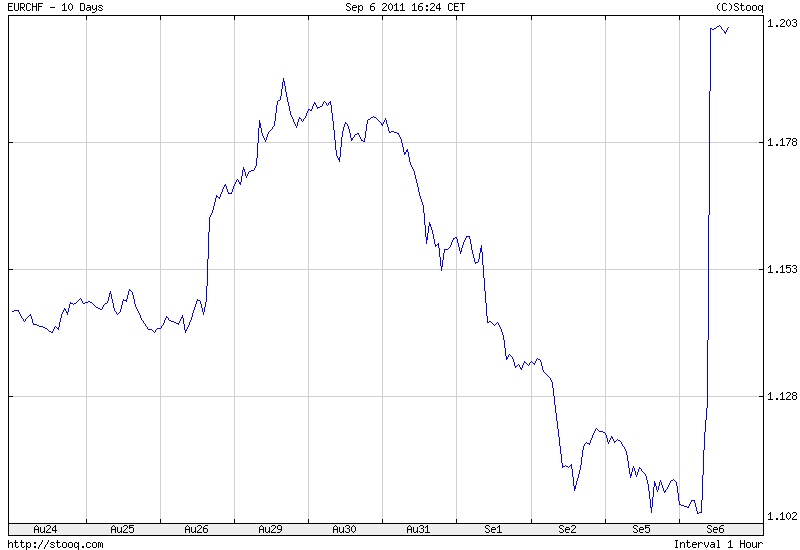 By buying euro, SNB will increase its already substantial foreign reserves. This creates a risk of loss if the value of these reserves decreases. However, by providing the floor for EURCHF exchange rate, SNB can defend the CHF-denominated value of its holdings. 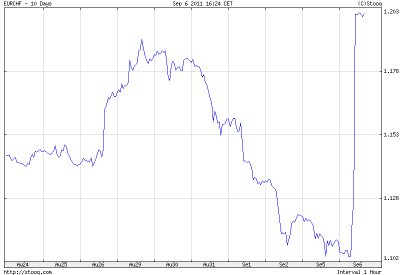 Hence, if EUR strengthens, SNB makes - at least on paper - a profit on its position. And if EUR weakens, SNB can defend it by buying even more EUR with unlimited funds. There is a problem with unwinding the position though. The larger the EUR position held by the SNB, the harder it is to sell it without affecting the markets and pushing EURCHF down. One possibility would be to park accumulated EUR at the ECB, using a swap construction similar to the Dollar Liquity Swap Lines previously provided by Fed. SNB could swap its EUR with ECB for CHF at the fixed rate of 1.2000, securing the CHF-denominated value of its foreign holdings. However, banks would need to somehow square the interest differential between CHF and EUR. For example, while CHF LIBOR O/N rate is currently (minus) -0,00333%, EUR LIBOR O/N stands at 0,83438%, meaning that on each one billion of EURCHF, ECB would have to pay roughly 8,4 mln EUR of interest daily. Unless both banks set the IR for the swap at 0%. BTW: Can BOJ perform similar intervention?